The ever-evolving trumpeter moves from puppetry to trapeze projects, by way of the downtown scene. When you start your career writing music for giant puppet productions and circuses, there's a good chance you're going to end up somewhere interesting. For Healdsburg native Sarah Wilson, a journey that started in New England's acclaimed Bread & Puppet Theater has taken her to New York City's avant-garde Downtown scene and back to California, where her rapidly evolving sound makes a mockery of familiar categories like jazz, pop, funk, and world music. Since returning to the Bay Area in 2005, the winsome trumpeter, composer, vocalist, and songwriter has developed a strange and beautiful book of songs and tunes that slide from haunting confessionals to dance-inducing New Orleans grooves. While she collaborates with some of jazz's most vivid instrumental voices, Wilson has followed her muse into uncharted territory, a realm where mystical Persian poetry sits comfortable next to her sorrowful crooning of Joy Division's "Love Will Tear Us Apart." "It would be completely radical for a jazz trumpet player, but I don't think of myself as a jazz trumpeter," Wilson said. Nor do any of her collaborators subscribe to a traditionalist definition of "jazz." The superlative band featured on Wilson's new album, Trapeze Project, includes Tin Hat clarinetist Ben Goldberg, pianist Myra Melford, bassist Jerome Harris, and drummer Scott Amendola. All five musicians will appear at Yoshi's on November 29 to celebrate the album release. "I'm not worried about trying to sound like Clifford Brown," Wilson continued. I'm writing the music I want to write, and the inspiration is coming from all over. When I get up to the mic, I'm really relaxed. I've been singing my whole life, and I can feel people responding to this music. It's challenging to have it be so personal and intimate, but I guess I like it. With the trumpet, it's a challenge to feel connected. But I'm working on having all the voices connect, compositionally, the trumpet and my vocals." 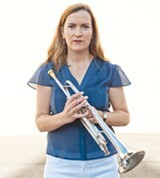 Growing up in Healdsburg, Wilson played trumpet for several years but never really devoted herself to the horn. After graduating from UC Berkeley in 1991, she moved to Vermont, where she spent two years with Bread & Puppet Theater. 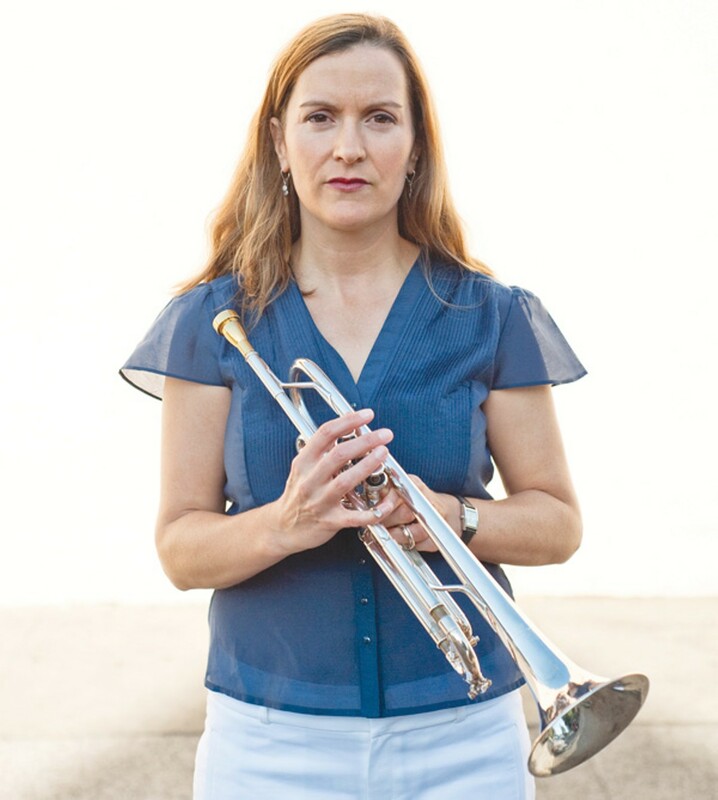 While initially hired as a puppeteer, she soon found herself composing music for productions and leading the company's brass band. The music not only provided commentary and atmospheric support for the puppet action, it drew people to the company's outdoor processions and site specific performances. "I became more and more focused on music, leading the Dixieland-style band that moved people between scenes," Wilson recalled. "We were playing trad tunes like 'St. James Infirmary' and 'Down By The Riverside,' so I was learning to improvise in the context of this New Orleans Dixieland-type music. I was actually involved in a ton of different shows, because there were circuses like the Domestic Resurrection Circus that would attract thousands of people, and we'd perform for twelve to fourteen hours. It was all about learning really tight cues. There were lots of ta-dahs, and we always worked on the timing." By the time she settled in New York in the summer of 1993, Wilson was practicing trumpet two hours a night, and seriously exploring jazz. Spending time at the old Knitting Factory when it was still the experimental Downtown scene's most important outpost, she absorbed the devices and aesthetics of master jazz conceptualists like Melford, Henry Threadgill, Bill Frisell, and trumpeter Dave Douglas's Balkan-influenced Tiny Bell Trio. She received a life-changing phone call in 1995 when the Lincoln Center Out of Doors Festival commissioned her to write a score for an annual giant puppet production. "I had never written music, so when I sat at the piano, it was very intuitive," Wilson said. "I didn't really know anything about harmony or chords. I developed these melodic lines and these funky bass lines." She assembled a stellar band featuring former Bay Area residents Kenny Wollesen (drums) and Peck Allmond (trumpet and saxophone), plus bassist Tony Sherr. As the house composer for the Lincoln Center festival, she honed her compositional sensibility, writing themes that enhanced the drama of the puppet performances. She documented some of that translucent music on her beautiful 2006 CD Scenes for an Imaginary Play (released on Phillip Greenlief's label, Evander), featuring Allmond, Wollesen, Harris, and guitarist Steve Cardenas. 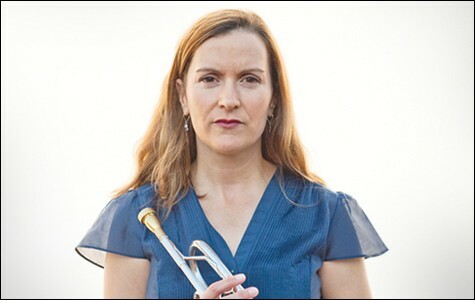 Since moving to the East Bay, Wilson has been developing the Trapeze Project, a body of music that reflects the derring-do with which she combines traditions and idioms. Most striking is her emergence as a vocalist. Plainspoken and remarkably unaffected, she delivers lyrics with beguiling emotional transparency. Meanwhile, her trumpet work has grown increasingly confident, though each melody still gleams with delight and wonder. Rather than simply imposing her vision on her band, she provides a forum in which they can join her in play. The success of Trapeze Project reflects Wilson's rare gift for making friends and connections. She's also attracted an impressive roster of funders, winning grants from the East Bay Community Foundation, Zellerbach Family Foundation, and a coveted fellowship with the Djerassi Resident Artists Program. Her latest is a prestigious Investing in Artists grant from The Center for Cultural Innovation, which will underwrite a new project paying tribute to her female jazz mentors: pianist, bandleader and composer Carla Bley, with whom she's not acquainted; her former trumpet teacher Laurie Frink; and pianist/composer and Cal music professor Myra Melford. Friends since their days on the New York scene, Melford has provided moral and creative support for Wilson, encouraging her to follow her muse wherever it takes her. "The last few years Sarah has really found her voice as a composer, singing and writing songs that feature herself," Melford said. "She's not afraid to mix that up with more jazz-based instrumental pieces. She's not afraid to embrace pop music and jazz and world music, and put them all together in her own way." Melford acknowledged that even the most open-minded jazz fans might be slow to embrace a singer-songwriter, no matter what her credentials. But Wilson is different. She almost always exceeds expectations. "In the case of Sarah, this is her voice," Melford continued. "I really admire the ebullience of her writing, that she can bring all the multiple influences and references and make them completely her own."